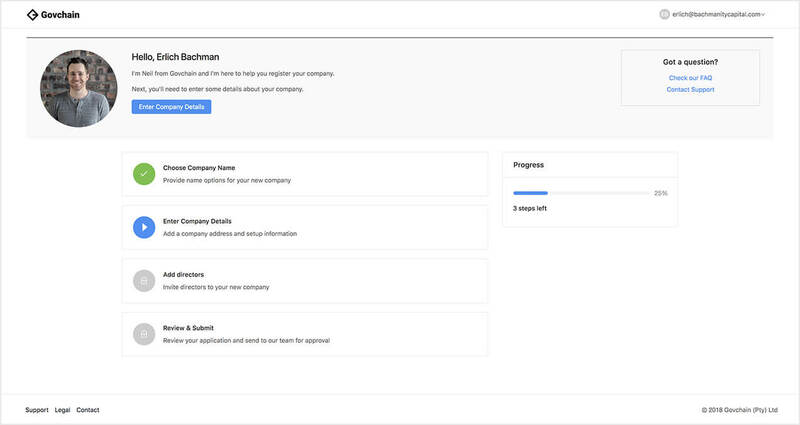 Register your company in 3 minutes. No Paperwork • Sign Online • Verify ID Online • R880 once-off cost. All you need is your ID document. No paperwork required. Starting a company can be complicated. We built Govchain to make this easy. It’s super simple and only takes a few minutes to complete. We'll make sure your new company is setup correctly. We’ll help you do paperwork safely and keep everything organized. 100% of our effort is focused on keeping your business healthy. Company information is automatically filed and kept up to date with CIPC. Your personal data is kept 100% secure via 256-bit SSL. The team at Govchain turned around my application with CIPC within 8 hours and sent me all the necessary documentation via their intuitive and user-centric website. I highly recommend GovChain. I'm so happy with your service. I was having trouble registering with the CIPC, Govchain helped me out. Within 5 days my problems were solved.Thanks a mil! You guys run a great company. My experience with Govchain was nothing short of exceptional. They even helped me with suggesting a payment gateway and legal advice. I wish other South African companies were half as good as Govchain. Govchain (Pty) Ltd (registration number 2017/257825/07) is a registered third party CIPC provider in South Africa. Our business address is 9th Floor, Ideas Cartel, 113 Loop Street, Cape Town, South Africa, 8001.